Well, as I was writing the inaugural Friday Flyer last week, I took a peek at the schedule to see who was writing this week. Lo and behold, I discovered myself! I suppose it’s a good thing that I was doing that. To be honest, I hadn’t planned on putting any time into this Standard format at all at this point, planning to favor Expanded, but with Oaks so not-far-away, I concluded that simply wasn’t a viable option for content coverage and spent my weekend getting up to speed on the new Standard format. It’s a pretty wild place! We saw the first major tournament of the SM-on format play out in Melbourne this weekend, and it was over early enough (bless the time changes) to affect some of this weekend’s Cup metas. We saw that event feature myriad decks with some level of success, but it’s not really any surprise given this rotation is the biggest shake to the Standard format in many, many years. Vikavolt/Rayquaza took home the title Down Under, and perhaps that’s not surprising, as the new format seems to be shaping up as a battle of broken Abilities (given Garbotoxin has retired to Expanded, this is not a surprise itself). My brother Alex will be here later this week with his debut article, going over the events of Melbourne in more detail as someone who was in the room, but I’m going to take a run over some of the decks from the format today. First off, I want to talk through how the different entities in the format right now “interact” with each other—it’s one of the better sections I think I’ve ever written for UG, so I hope you’ll read it before getting to the lists. 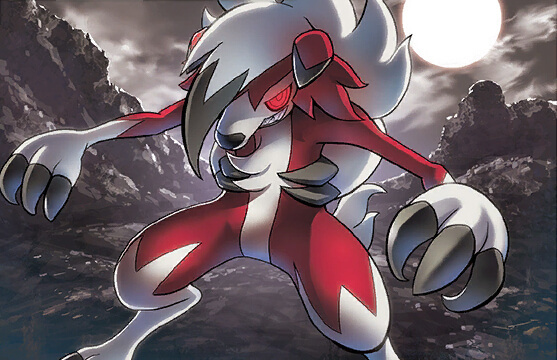 There are a few Zoroark concepts to look at, then I’m going to offer lists for a testing gauntlet, since I think we’re getting too close to Philadelphia to have some of these decks go completely unmentioned. Without further ado, let’s take a dive into it. To me, in a format with many players bemoaning the lack of consistency options, I think Zoroark-GX is positioned incredibly well. It’s still the broken card we all know it as, but now it just lacks some of the tools it had previously (mainly, Puzzle). This removes a lot of versatility; true. Nevertheless, Trade is a wonderful deck-thinning and draw mechanism that makes the deck pretty impervious to many of the problems other decks currently face just trying to get off the ground. The 2019 Standard format is in an odd spot where it seems like many decks are trying to execute a strategy entirely independent of what’s happening on the other side of the board. This is a major reversion from just a few weeks ago, as Worlds featured one of the more “interactive” formats that I can ever remember: decks played very differently depending on what you needed to deal with on the other side of the table. By contrast, SM-on is more about executing a “broken” strategy and winning the game more quickly than your opponent. It’s almost as if you’re playing in parallel to each other, rather than in opposition. Now, obviously, it isn’t a perfect parallel—other decks play ways to deal with each other in SM-on still. My point is merely that the continuum has shifted more back toward “parallel players” from “interactive games” (Now, unlike many of my peers, I have no interest in characterizing that as good or bad; it is merely where we are in my eyes). It’s a bit ironic that I use “parallel” to describe this effect, because Parallel City was a key part of the interaction Zoroark offered in the last format. Between it and N, Zoroark could keep up with the Ability-behemoths even without Garbotoxin. Zoroark-GX, if it is to succeed in this upcoming format, is going to need to find a way to make the 2018 Standard style work while dealing with the untempered madness offered by 2019’s edition of the format. Sounds easy, right? Find a way to eliminate the other deck’s staying-power from the board, then deal with the attackers. That last one is a little more abstract. What I mean: many of the decks in this format function directly off their board; that is, they theoretically don’t need any input from hand to keep moving. Vikavolt SUM and Metagross-GX are just two of the examples here. While both sometimes want things from their hand, unless you KO the Stage 2 itself, the opponent is always going to have some options at hand. If they miss Max Potion or Energy Recycler, maybe things get a little ugly for them. But, they will be able to build attackers, generally speaking. Comebacks are really, really hard against these sorts of concepts. A few decks in the format operate directly off their hand: Magnezone UPR is the best example. If they don’t have the right cards in hand at the right time, they have major problems. Susceptible to Judge (and, previously, N). We saw a pretty cool addition of Ribombee BUS in the Melbourne runner-up list to help mitigate this effect, as it allowed easy access to energy from the deck every turn. Between Ribombee and Mt. Coronet, Magnezone went from a play-out-of-your-hand deck to a play-off-the-board deck. Without Ribombee (or similar board-sustainability)? Bounce their Stadium, play a Supporter to disrupt, and watch as their strategy gets a little dicier. With Ribombee? That’s one scary mess to work your way around. I can’t understate how powerful working off the board instead of out of your hand is, especially in a format without stellar Supporter draw. We’ve become so accustomed to decks being able to will whatever combination of cards they want into their hand—Octillery, Trade, Puzzle of Time, Professor Sycamore—that I think many lists are forgetting to allow for the fact that this just isn’t strictly possible at all times. Trade is the last one of that old guard standing, which makes Zoroark the last frontier for the old style of play, in my mind. This “parallel” vs “interactive” manifests a bit in deck construction, too. I think we could see a trend back toward a few years ago’s Supporter counts, where every deck is dedicating 13-15 spots to Supporters and 4-7 to “Ball” cards as a search mechanism. That makes for pretty boring deck building, admittedly, and we aren’t yet seeing that in most lists for Standard right now. You’ll see it more in my lists today, as I believe it’s where the format is going: consistency usually reigns king over 15 rounds, and it’s going to be more important than ever with 6-2-1 cuts (with that said, this is an element where Juniors/Seniors/APAC+LATAM Masters may see lists of different styles actually be better plays, as straight Top 8s reward risk/reward payoff a lot more). Let’s cut back to Zoroark. Here’s a list that I think works on the above concepts, with the goal of making your opponent’s life very difficult while keeping you moving toward winning the game. One-ofs have gone from one extreme of usability to another: before, with Sycamore and Puzzle of Time in the format, discarding a random one-of early in them game was no big deal—maybe it was even preferable! You could recover it later with Puzzle, and all would be well. We’re now at the other extreme: you’ll never discard it unless you want to, as none of our Supporters are looking to do that, but you’ll also get exactly 1 use of it—so it better be good. With that in mind, we load up on some key cards. The 4th Tapu Lele is remarkably European, but frankly, given the last few years, I think maybe it’s time the Americans give this one up and learn from what’s won. The trio of Treasure, with the 4 Lele, give us a decent shot at using whatever Supporter we want—as long as a bench space is open. Without Parallel, that’s a lot more complicated a qualification than it used to be, but we have to work from somewhere. Let’s talk Supporters: Cynthia and Guzma represent an ideal turn; you’re either playing the best available Supporter in the game or taking a Prize. We max out as a result, though without Sycamore to waste them anymore, I can see a World where 3 Guzma is more appropriate. Zoroark is the best deck to abuse Judge in all the world, and therefore we have a just-short-of-full set there too. I could see a 4th quite easily over the other disruption Supporter: Wicke. Wicke is a bit crazy of an idea, but given the format’s draw power at the moment, I think it’s a reasonable consideration. 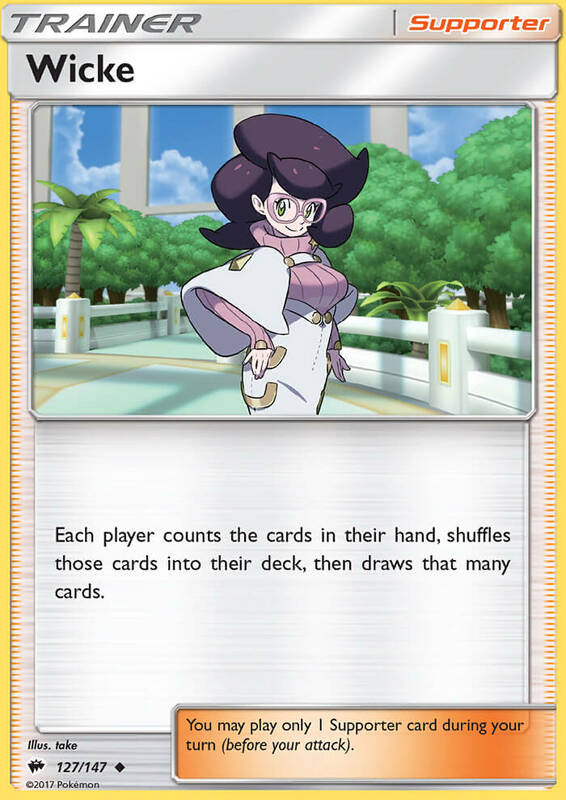 Zoroark will generally have lots of cards in hand, so we’re comfortable with shuffling our own count back in, but when your opponent burns their own hand down to 1-2—and, even now, it’s probably a Supporter—there are lots of spots where this Wicke could be debilitating, especially next to Judge. It’s an idea I’m excited about. I think Apricorn Maker is inviting trouble: Garbodor GRI isn’t going to go away that easily, and for it alone, I favor Pokémon Fan Club. If we went to Apricorn Maker, we’d have to involve Timer Ball…and I’d just rather not do those things. Tapu Koko SM31 is great because a format without Float Stone is a format in want of Free Retreat. As an added bonus, a Flying Flip into a Devoured Field’d Rioutous Beating is a great way to deal with a Magnezone or Vikavolt (the only problem: Magnemite doesn’t care about your Flying Flips). The same is true of a Rayquaza-GX. 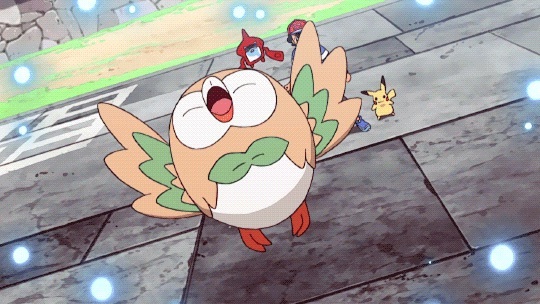 In addition, it fuels the list’s other weirder inclusion: Dedenne FLI. This, for a DCE and Choice Band, can easily dispatch a Rayquaza-GX. With Mallow, I think the odds of setting this up aren’t too crazy, and it can effectively swing a game. 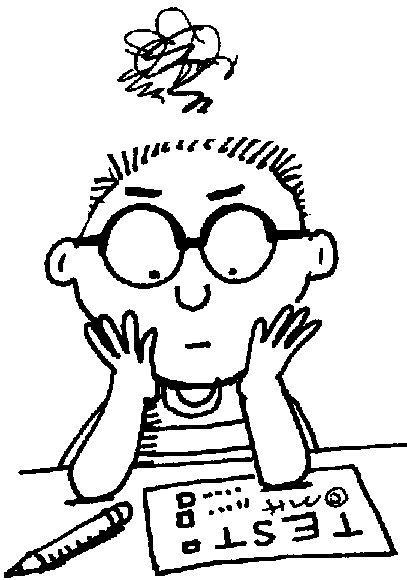 A key problem presented by this format is the finite nature of our Double Colorless supply. Since the days of Special Charge and Puzzle have passed on, we need to ensure there’s enough energy working in the deck to achieve what we need. Counter Energy is a logical answer here, as it allows us to more-comfortalby utilize the non-GX tech attackers. Of course, you have to be losing, but those attackers are generally best in that spot anyway. If you’re winning, the 4 DCE are probably enough to get by. A tech idea: Lunatone BUS/Solrock CES. Metagross, Gardevoir, and others will probably try to make a living in this format by healing away 2HKOs. With this combo, they can’t do that, making Zoroark’s 2HKOs of its own much more significant. This is especially interesting in a deck like Zoroark where the requisite deck space might plausibly be accessible. That’s my crazy idea for the day. Let’s take a look at a more conventional Zoroark spin. Tate & Liza: Highly underrated moving into the new format because a bunch of people have forgotten a world without Float Stone. Good card. 2 Rescue Stretcher: We need specific Pokémon at specific times, and this frees you up to use one of your Stretcher on a take-one-to-hand and leave the other for a more thorough cleanup later. Buzzwole FLI: It isn’t the titan it once was, but it’s still pretty useful for that 4-prize turn. Many decks need to over-commit resources to actually deal with it, which makes it pretty strong. Zoroark/Garbodor: Likely still quite strong, but see Pablo’s article. Zoroark/Lucario: I think this has high potential, but the lack of Strong Energy means it’s probably looking at 2HKOs. Would want high Acerola, high Super Scoop Up, and other counts that might not fit in a cohesive list. Could maybe explore Shrine of Punishments as a way to make up the differences between 170-190 while fueling the GX attack, too, but that’s probably a different Lucario deck. Zoroark/Shiftry: Shiftry-GX has seen an about-right amount of hype in my mind: it’s not being talked about everywhere, but there’s some talk. Extrasensory is quite good for its potential OHKOs, and Shiftry is certainly quite bulky. Confusion probably underrated without Float Stone in format, and it’d be a nice poke-for-70 with a Choice Band that a Zoroark could finish off later. GX attack probably not very practical, but a cool concept. Zoroark/Gardevoir: As I’ll cover in a minute, I prefer Gardevoir/Sylveon, but there’s no room to deny that this could be a good combo. Twilight-GX is even more broken compared to the rest of the format than it used to be now that Puzzle of Time has been retired, Rayquaza-GX looks to be big, and Trade is still king. Lots of things to like here, but I think it could still fall victim to the colossal effort involved in getting this many Basics and evolutions in play before Rayquaza/Vikavolt starts pummeling the board. In much the same style as the Zoroark/Lycanroc list above, I’m going to offer the following as the lists I would use for testing for early-season SM-on events. Going to skip the full analysis in favor of a quick 2-3 key points, but since I’m doing that, in a fashion even more than normal, please find me in the comments if you’d like to clarify anything further. Many of these lists are going to follow the following principle: I probably haven’t tested the exact 60, and maybe even wouldn’t play the exact 60 for a tournament, but from what I have tested, these are the 60 cards that will give the best idea of how a given matchup flows—ideal for testing. I had an Alolan Ninetales BUS in this list before reminding myself that the point here is to test matchups, and that’s not conducive to that. Alolan Ninetales is good in spots where your opponent has put themselves in a position to deck out before you would. Guzma are now finite, so if you play things correctly, certain concepts could be cheesed out of a win. Consider it as you get a better grasp on the format at large. I really hate playing Dhelmise, but you need a way to OHKO Dusk Mane Necrozma, Zoroark-GX, and other applicable troublemakers. The problem with Dhelmise is that you’re essentially never going to T1 Beacon if you start it. Sadly, there is no better solution. Acro Bike in a Stage 2 deck: welcome to the wild side. In this Stage 2, though, you want to see Energy to the discard pile, so it’s a little less crazy. Overall, I’m not too high on the concept, but this is how I’d build it right now. Likely struggles too much with Ray/Vikavolt. Mysterious Treasure can both fetch us any Supporter we want and Marshadow, which acts as a pseudo-Supporter in the sense that Judge is a real, playable card in this format. Massive value here. Tate & Liza isn’t necessary because we can Treasure for Volkner for Switch. Else, I’d want the searchable Switch in a deck that parks a 3-retreat Stage 2 on the board. Unlike Vika/Bulu of old, this deck has the trait of playing off its own board coupled with the fact that its board doesn’t self-incinerate every turn. This makes it all-the-more powerful, and is why I think it’s the format’s deck-to-beat at the moment. Most decks are either going to waste a lot of energy to Judge you or are going to shrug and allow the Magical Ribbon to stick. For this reason, I considered something really weird like a 4-2 Sylveon to get it more often, but I went back to this as a concession to the realities of deck space. Nothing good we can do with those extra Eevee, unfortunately. 7 Fairy isn’t comfortable, and I’d like the 8th from somewhere. You could look toward a Choice Band or Max Poiton or other consistency slot, as these lists are definitely tailored toward “execute your strategy as much as possible” to get feels for matchups. Maybe I’m wrong on Tate & Liza. If I am, this article isn’t going to age very well. Tapu Koko SM31 could be good in here, too, if only as a way to facilitate Guzma. No deck in format relies as much on switching as this one, and I’ve included counts to accommodate that. Dawn Wings Necrozma SM106 is a nod to the fact that a Hoopa SLG could otherwise shut this down. You could omit it, if you wanted, but I think it’s also a good general-purpose attacker. The problem with this deck is likely also its greatest strength: linearity. Choice Band+Timeless-GX should be a pretty reliable way to deal with Rayquaza-GX/Vikavolt, as I’m not sure they can readily recover from such a game state swing (if it doesn’t just outright win you the game on Prizes anyway). 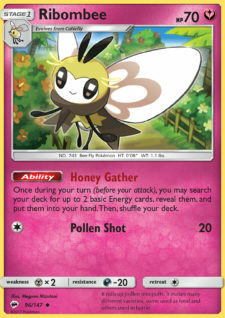 Like I mentioned earlier, playing off the board is awesome, and Ribombee is a great thought in that respect. Major props to Shane Quinn and crew from Australia for the innovation there. Rescue Stretcher is missing from my list because I don’t think there’s anything we strictly need to Rescue in a format now-void of forced discard, and with no particular techs to demand reuse. Possibly one of the stronger decks in format, in my mind, because it has an absurd damage cap, lots of room to be built in different ways, and requires fairly minimal setup. I hope this puts you on a pretty decent footing for testing SM-on, as Oaks’ Regional is quickly approaching for NAers, and with Brazil having one a week before and Germany later in September, we’re full-on into SM-on at this point. As always, if you have any questions or comments about anything I’ve written today, or just generally site-related, please feel free to reach out. You’re free to try Twitter or Facebook DMs, but I’m about 50% more likely to see a forum PM or email if it’s something you can try.